Veteran journalist and author Joseph C. Goulden offers a good review in the Washington Times of Ron Chernow’s Grant. Grant’s legacy long suffered for two reasons: his reputation of being a heavy driver, only partially deserved, and multiple scandals that marred his two-term presidency, although he was not personally involved any of the affairs. Mr. Chernow’s detailed book examines both issues in a detail I have not seen in earlier biographies, and he essentially acquits Grant. ...To insure a future for his wife, Grant spent his last years writing a memoir of his Civil War experiences. And here is the most moving section of Mr. Chernow’s masterful work. Grant wrote as he was dying of painful cancer of the tongue. 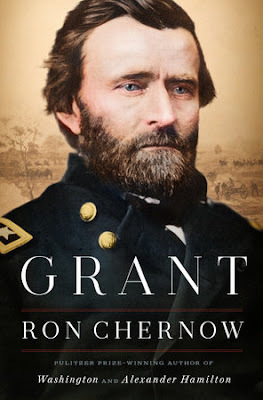 Barely able to speak beyond a whisper or hold a pen, he produced a work that Mr. Chernow calls “the foremost military memoir in the English language.” The two-volume work quickly sold 300,00 copies and left his widow a fortune of $450,000. The memoir continues to sell.